Swimming with the dolphins has somehow become one of those things that is on just about everyone’s bucket list. And while that’s probably a lot of fun, we rather think that swimming like a dolphin looks even better. 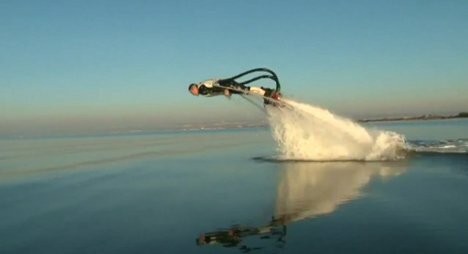 The apparently very fun people at Zapata Racing had exactly the same idea when they created their Flyboard: a cool water-powered jet pack that lets you glide around effortlessly above and below the water. We can finally stop asking where our jet packs are, because obviously we have arrived in the future. The awesome device is said to be easy enough to learn, although the company likens it to learning to walk – which to our knowledge takes about a year. Still, they say that with an instructor you’ll be doing cool tricks like the guy in the video in under 20 minutes. Without an instructor, it should take under an hour. The learning curve would undoubtedly be worth it once you start leaping through the air and splashing into the water like some kind of crazed fish person. The jet packs will soon be made available for regular people to own…regular people with money, that is. 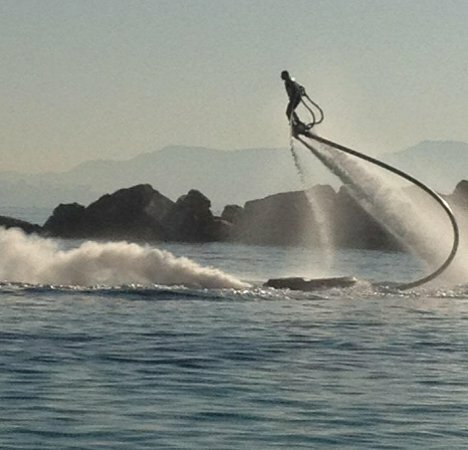 The Flyboard’s price tag is €4900, or around $6300, which we think is pretty darned reasonable for a jet pack.